A very beautiful and stylish Hawaiian jewelry design. 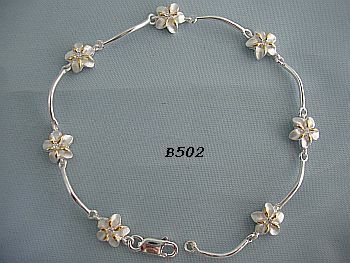 Solid sterling silver bracelet, polished curved bars link the Hawaiian Plumeria (frangipani) flowers. Featuring frosted finish flowers, each with 14 carat gold plate highlights and central sparkling clear cubic zirconia. Secured with a strong lobster clasp. Ideal as bridal jewellery. Measurements: 185mm in length, flowers 8mm diameter.